Even today, the memorials in 150 countries tell stories of our Indian soldiers who perished fighting in the World Wars. CHENNAI: The British Indian Army during the World Wars was the largest volunteer force from among all the other troops from the Commonwealth. Many young men who travelled into unknown territory to fight in the war lost their lives in Europe’s battlefields. And surprisingly, Europe remembers them better than Indians –— this was the point driven home by Air Marshal S Varthaman, who delivered a lecture on ‘How Europe Remembers Indian Soldiers of the World Wars’ recently at Alliance Francaise. The Commonwealth War Graves Commission, set up in 1919 after World War I, today maintains graves and cemeteries in 150 countries across the world to remember fallen soldiers of war, he said. “These include over 2,000 acres at 23,000 locations. In India itself, apart from the first known war memorial which is India Gate (previously known as All India War Memorial), t maintains war cemeteries in Delhi, Madras, Kirkee and Kohima,” explained Varthaman. The CWGC runs by contributions in proportion to the number of war graves from each of the Commonwealth countries. Typically all the graves are in the same format — the same tombstone, inscribed with the name of the soldier, the regiment he belonged to, with every tombstone having the regional flower. Everything is preserved in the manner stipulated by the CWGC, right down to the height of the grass and the time the trees are to be pruned. Apart from the war graves, Varthaman elaborated on memorials for fallen Indian soldiers in Europe. “The Neuve Chapelle Indian Memorial in the commune of the same name in France is dedicated to nearly 4,700 Indian soldiers who died in the Battle of Neuve Chappelle in 1915 during World War I, and have no known graves,” he said. This includes the posthumous awardee of the Victoria Cross, Gabar Singh Negi. “Even today, there are multi-faith religious services for the fallen soldiers that are organised by different organisations in their memory,” he explained, adding that Prime Minister Narendra Modi recently visited the memorial in 2015 and wrote in the visitor's book. He also detailed the important memorials in the UK such as the National Memorial Arboretum, which is a large woodland landscape with 30,000 trees and a vast collection of memorials nearly 300 in number, dedicated to separate classes starting from woodcutters to nurses and soldiers. “All of them played a part in the British victory. The Arboretum has trees planted named after each of the Indian regiments that took part in the wars,” said Varthaman. He also mentioned the Brookwood Cemetery (also known as the London Necropolis) in Surrey which houses the Brookwood Memorial 1914-1918, whose plaques had names of Indian soldiers whose records were not found anywhere else. 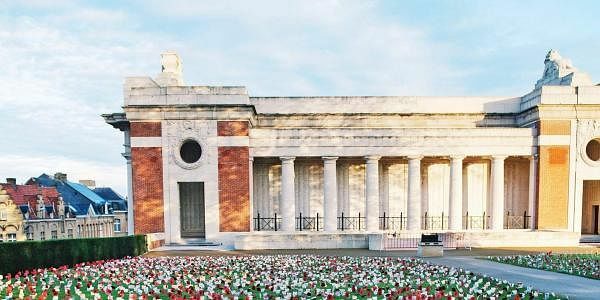 “One memorial of significance which also pays tribute to Indian soldiers is the Menin Gate in Ypres, Belgium,” he added. “It also has a Gurkha Memorial alongside the memorial for the Assam military, Burma military, and Sikh regiments who fought in those wars,” he said, while going on to regale the remarkable tale of violinist Hans Vermeesch, who plays the Rabindra Sangeet in honour of the fallen Indian soldiers on every Memorial Day. “What these memorials show is that as far as honouring the dead goes, Europe does not differentiate between countries. They honour the soldier, and his spirit,” he said.